My last chicken cook, just for the family. 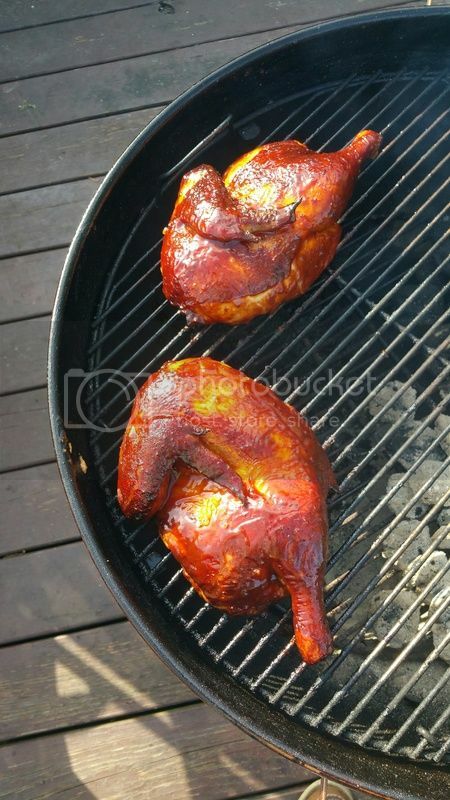 I pretty much know how i did these and will try to same thing on half chickens. Cooked them on the 22" Kettle, indirect heat, and a combo of a couple rubs and sauces. Will give it a run soon and see what i come out with. Good looking yard bird brother. Nice color. Yes Sir, looks like you got it down. That's some good looking yard bird for sure. Thanks guys. I just have to stay out of my own head on the chicken. 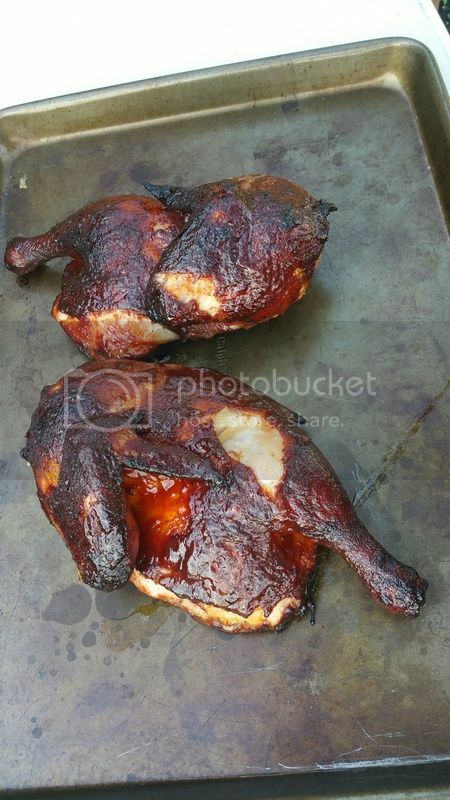 Did a neighborhood cookoff a few months back and change up the whole chicken thing and tried to really smoke it. Came out a rubbery useless mess. I have to remember i have been knowing how to BBQ chicken for a LONG time, and have "refined" it a little over the last couple of years. All i have to do is BBQ the chicken and be sure to get it off the grill at the right time and I should be fine. Appreciate the hints and info guys. 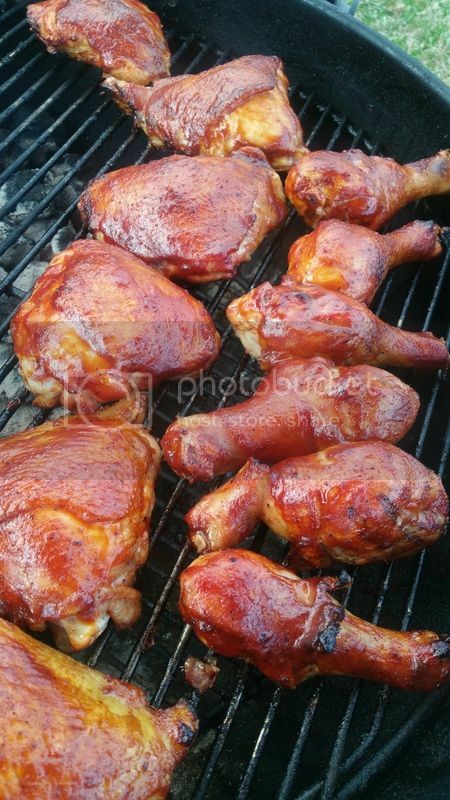 TwoGuysBBQ wrote: I have had great success with brining by yard birds. I've never brined and injected at the same time. The brine usually provides enough moisture and flavor profiles come from the rub and smoke. I highly recommend KOSMOS Chicken soak. it sells for like $15.00 and its enough for like 6 - 8 birds. Thanks for the tip TwoGuys. Placed a order with Kosmos yesterday. Ran my first test Half chicken cook for a cookoff in late April. It is completely different when cooking not just for the family. Problem 1: I put light dusting of cayenne which completely overpowered all of the other flavors. It wasnt TOO hot, but definitely masked the other flavors. I may give the cayenne another go, but layering FIRST instead of last to get more of a backburn than a covering burn. Problem 2: Sauced too early. 30 mins after saucing the color was just about perfect. By the time it was done, i had more char on the sauce than i want. NO saucing till about 30 mins before chicken is ready. Problem 3: I think the skin tore where I probed w/ the thermopop. I learned a few lessons and I am going to have another testrun in a week or 2. Definitely brine (after inspection) for a non sanctioned cook fer internal juiciness. One tip: often judges want crispy skin and not rubbery skin. Dry the skin w paper towels and then lightly rub the skin w salt, or even better, salty rub, right before putting in the cooker, and the skin will be crisper. If you cook real slow and mop yer chicken, then save this step fer later in the cook.